Last night I was teasing a friend that she needs a mom cave. Ok, I was actually mostly serious. 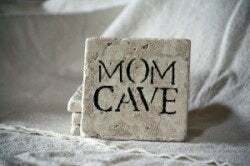 This morning I got to thinking, "What would I put in a Mom cave?" Then I fell down a Pinterest rabbit hole. The worst ideas I saw had washers and dryers in them. The best one I saw was a wine cellar and I don't even like wine! If I had a mom cave it would have lots of empty space. There would be big pillows or bean bag chairs on the floor and a hammock. There would be a coffee pot, refrigerator and microwave. Instead of wine there would be beer. I would keep extra chargers there for phone, kindle and ipad. I would have my own private bathroom out there so I could go to the bathroom and shower in peace. There would be speakers and an amazing audio system. What would you put in your mom cave? Or woman cave if you don't have kids?